The J-INFRA is a cardioid infra subwoofer that can be used to supplement J-Series systems consisting of J8, J12 and J-SUB cabinets. 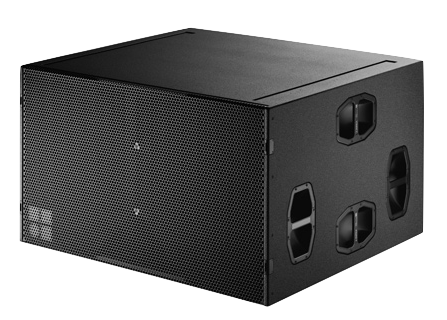 It extends the frequency response of a J-Series system down to 27 Hz and can only be used in ground stacked configurations in conventional left/right set-ups, as well as arranged in an infra subwoofer array. It has two bass-reflex chambers containing three 21″ drivers, two facing forward in one chamber that are driven from a channel of the D12 amplifier and one facing backwards driven by the other D12 channel. Through this driver set-up its cardioid dispersion pattern avoids unwanted energy behind the system and greatly reduces the reverberant field at low frequencies, providing highest accuracy in low frequency reproduction. Selecting Hypercardioid mode in the D12 optimises the tuning of front and rear channels for a maximum rejection at the left and right sides behind the cabinet. The J-INFRA cabinet is constructed from marine plywood and has an impact and weather protected PCP (Polyurea Cabinet Protection) finish. The front and rear of the loudspeaker cabinet are protected by a rigid metal grill and the side panels incorporate eight handles. The cabinet front is fitted with four catches for securing an optional wooden lid. 27.0 x 46.5 x 41.03 / 45.6"